As part of its theological exploration of vocation, the Mercer Commons at Mercer University sponsored a year-long olloquium on campus on the topic of this book during academic 2003–2004. The colloquium produced a university-wide conversation on the proper relationship of faith and learning at a Baptist institution. The six best talks are included here with five essays solicited from among the nation’s most prominent scholars on Christian higher education. These essays come from scholars in a wide variety of fields: not just theology, but law, literature, political science, education, and philosophy. The essayists are teacher-scholars who genuinely seek to live out the sometimes-competing vocations of professor and believer. Though most of them teach in church-related institutions, they not only affirm the need for a clear theological vision on which to base institutional and pedagogical planning; they also stress the importance of diversity, pluralism, and true academic freedom. One explores the basis for a Christian vision of higher education in the literary classics of the West. Another addresses the peculiarly Baptist contribution to the conversation and the very notion of calling. The philosophy of teaching that emerges in these pages is a relational one, drawing upon Martin Buber’s I-Thou relationship, as well as Paul Ricoeur’s notion of the transformational implications for pedagogy contained in biblical parables. 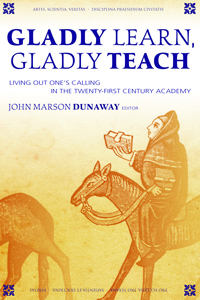 Chaucer’s description of the Clerk in the Cantebury Tales says, “Gladly would he learn and gladly teach.” The Clerk is an admirable role model for those who seek to embody a relational, transformational pedagogy that is faithful to the Gospel. All who care about Christian higher education will find food for thought in these pages.